Image: @TheGarden. Report submitted by reader Mike Omansky. Ziggler got some near falls, but Nakamura followed with a Kinshasa to the chest and pinned him. This was a very good match and Nakamura was over with the crowd. R-Truth won with his finisher. The crowd got into this after a while and both wrestlers worked hard. Neville pinned Alexander with his feet on the ropes to retain. 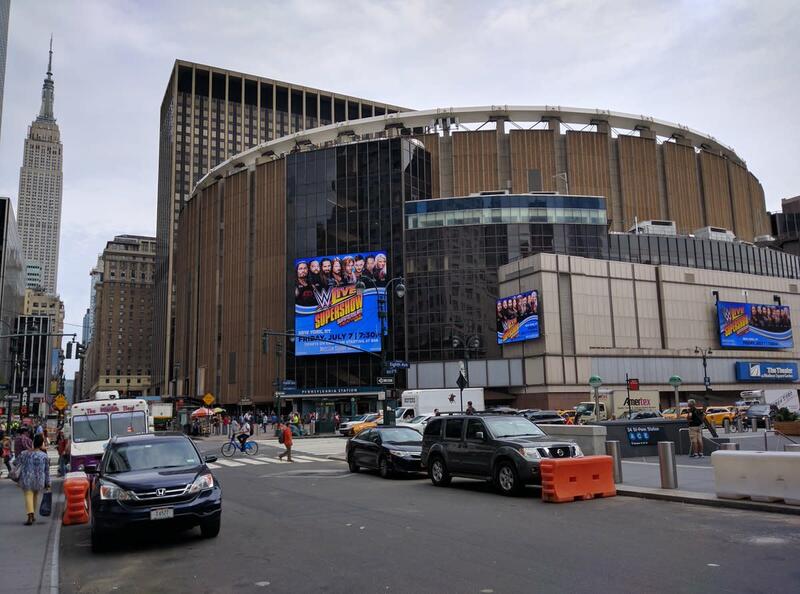 The Miz cut a promo before the match saying that he refused to defend the IC title at MSG because this is where the New York Knicks play. They had an excellent tag match, with Ambrose pinning Miz with Dirty Deeds while Rollins held Joe's leg to keep him from interfering. The match had non-stop action and both teams used double-teams well. Styles hit the Phenomenal Forearm to get the pin and win the US title. They had a very solid match, with it being the match of the night. Styles got a big ovation for winning the title. This didn't last very long but had good action. Banks submitted Emma with the Banks Statement. Balor hit the Coup de Grace to get the win in about a minute. There was good action from Balor in the match despite it being brief. The Hardys didn't see the champions make a tag and double teamed Sheamus (who wasn't the legal man). Cesaro then ran in and pinned Jeff. Reigns won with a spear. Wyatt dominated the match and was often cheered. Reigns got heavily booed. After it was over, Braun Strowman ran in to attack Reigns. Cedric Alexander and R-Truth came in and got tossed out. Seth Rollins then came down and was fighting off Strowman until Wyatt popped up and stopped him. Reigns recovered, knocked Wyatt down, and then speared Strowman to end the show.